In October 2004, my friend Marty emerged from his basement with a 69cm Raleigh Olympian that I could have for free. It had come to him used, and had probably spent most of its time in a basement. The components were nothing to write home about—the brakes barely worked, and the left crank started to come loose on my ride home. But the frame was in fine shape, and provided the perfect opportunity to satisfy my long-standing desire to build a fixed gear bike. A little online research revealed that the early '80s Olympian was a low-price model made in Taiwan for the American division of Raleigh, which had recently been sold to Huffy. The model did not enjoy much respect, and competed unsuccessfully against Japanese imports. 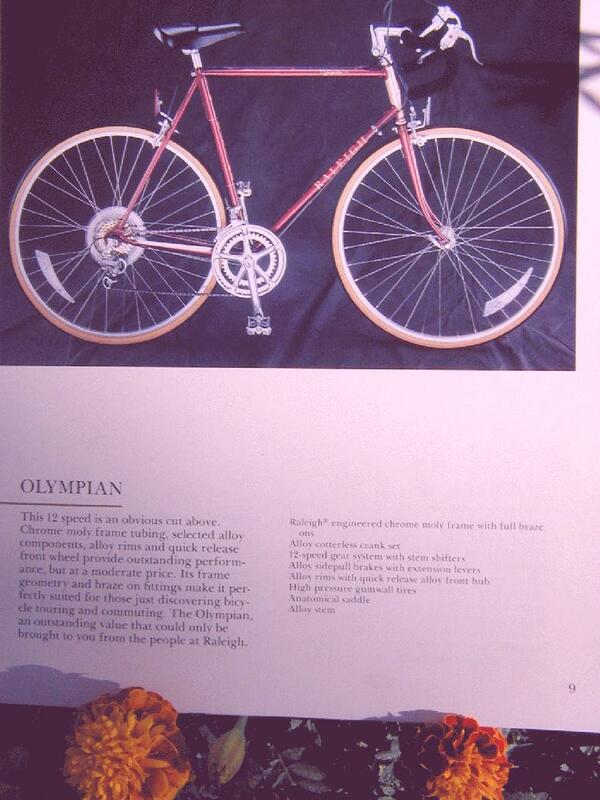 I found an informative web site that even has a scan of the Olympian page from the Raleigh catalog from that period. All the criticism seems exaggerated. Considering its size, the frame is light, and the paint job is attractive. I set to work, with some help from the fine folks at Broadway Bicycle School, who helped me remove a rotten peanut (yes, a rotten peanut) from the bottom bracket shell. I installed a Shimano cartridge bottom bracket, new 110mm BCD cranks with a 48-tooth chainring, and Wellgo pedals that are flat on one side and SPD on the other. In my basement I found a suitable front wheel: a 32-spoke Bontrager that had come off Kara's 2001 Lemond Poprad when I built her a wheel with a Schmidt dynohub for Christmas one year. The rear wheel I built from scratch, lacing a 36-hole Suzue Pro Max flip-flop hub to a Mavic MA-3 rim. I installed a 16-tooth Dura-Ace fixed cog and a 3/32" BMX chain. To ensure adequate braking power, I deployed new front and rear centerpull brakes with Kool-Stop red pads—I'm not a fan of the no-brake or single-brake setup fashionable on urban fixies. I then worked on points for style: a moustache handlebar from Rivendell, a fabulously sleek new-old-stock 130mm Shimano Dura-Ace stem from the early '80s, and a honey-brown Brooks B-17 saddle with large copper rivets. I bolted on some SKS P45 fenders, and the bike was ready for its first outing. The Raleigh is fast and responsive and requires little maintenance. I use it frequently to commute, and it's a pleasure to bop around town on it. It has also become something of a training bike when I don't have the time to go very far but still want to get plenty of exercise. And with reasonably wide tires (700Cx32), it performs well on dirt. In nearby Belmont, up the hill from McLean Hospital, there's some public open space that hasn't yet been consumed by encroaching development and provides gravel, sand, rocks, mud, and long grass. I enjoy testing myself there. Off road, a fixed gear bike enforces strict discipline: if you lose momentum, you walk.